Expands Neuropsychological Testing, Adolescent Services, ADHD treatment. BOSTON, Mass. 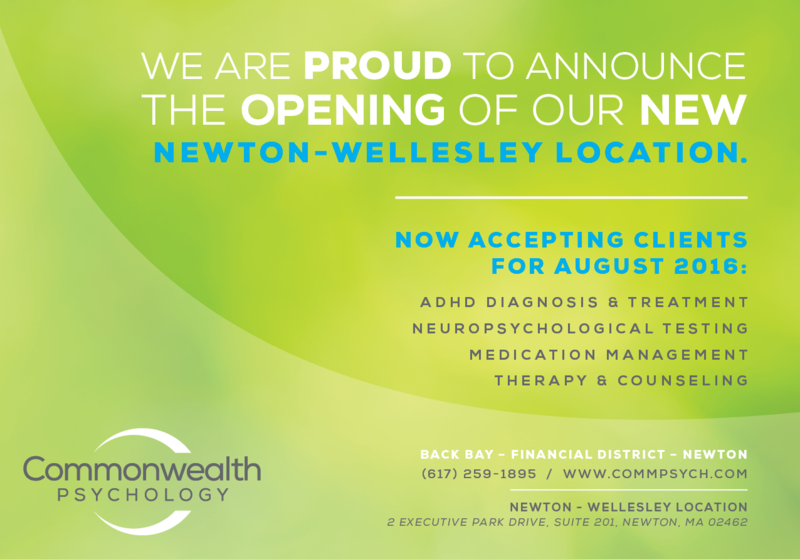 – July 12, 2016 – Commonwealth Psychology Associates (CPA), a leader in behavioral healthcare, has again responded to the growing demand for behavioral health services by adding a fourth location in Newton-Wellesley. The new office will open August 1, 2016 and will offer several specialized services including ADHD diagnosis & treatment, neuropsychological evaluation, health psychology, and non-medication treatments for attention and cognitive problems. CPA also will be expanding services for adolescents in the existing Newton Corner location. “With the new office space, we are re-deploying our staff and bringing on new clinicians who specialize in treating adolescents,” Dr. Piatt said. Given the significant shortage of psychologists and psychiatrists who are trained to work with younger clients, the expansion of these services is essential for improving access to care. Counseling can be helpful for adolescents who are dealing with anxiety, depression, stress, grief, and relationships with friends and family. Located at 2 Newton Executive Park in Newton, the new office is easily accessed from the Mass Pike, I-95 and Rt. 16. The convenient location and ample free parking will make it easier for students and families residing outside of Boston to access CPA’s signature behavioral health services. The Newton-Wellesley office is now accepting clients for August appointments. To learn more about CPA services, clinicians, insurance plans accepted, or to inquire about scheduling an appointment, new clients are encouraged to visit www.commpsych.com to complete a brief online inquiry or call (617) 259-1895. The standard in behavioral healthcare, CPA is a multi-disciplinary psychological counseling and behavioral health center dedicated to providing collaborative, state of the art assessment and treatment. CPA has four locations in Boston and Newton, MA, where approximately 40 doctoral psychologists, neuropsychologists, and psychopharmacologists offer specialty services, including: health psychology, stress management training, biofeedback, neuropsychological evaluation, ADHD diagnosis and treatment, medication consultation, and much more. Since opening in 2004, CPA has helped over 15,000 clients lead happier, healthier lives and has been named a 2012 “Top 100 Woman Led Business.” CPA’s dedication to promoting healthy, positive workplaces has been reflected in its designation as a 2014 & 2015 “Top Workplace” by the Boston Globe.